Hi friends. I have been absent from the blogging world of late. My Mom and Stepdad have been with us for the last four days. We had a great time!! And as always, I was sad when they left. My stepdad put the lighting in the kitchen for me. I am thrilled with it and will show it to you later after the finishing touches are added. So for now, here is my latest project. 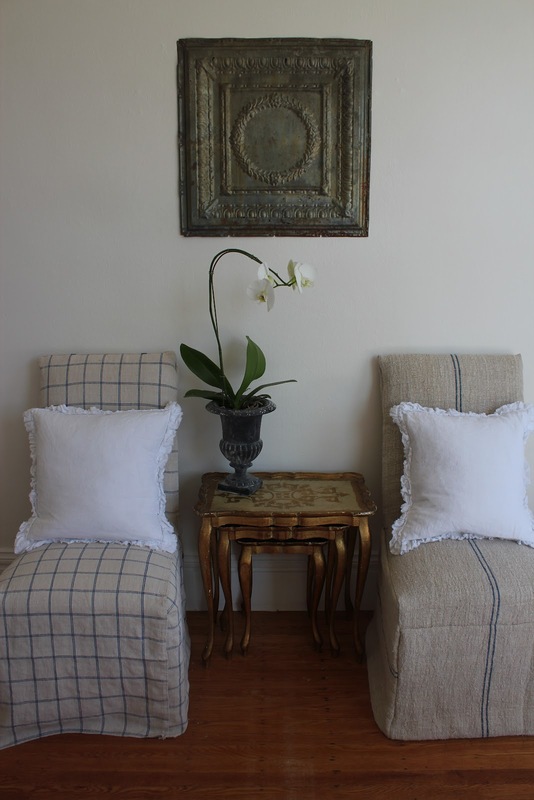 I made these slipcovers out of hand loomed antique hemp linen, or grain sack material dating from the late 1800's to the early 1900's. The one on the right is very nubby and those stripes are actually a grayish blue. I used yardage I had one hand for that one. And the windowpane one was made from two actual grain sacks which I ripped apart. I fell in love with this particular sack when I saw it. How often do you see this pattern? I think it looks out of focus but it is two thin stripes right next to each other. I sewed them by hand as I am not yet confident enough with my machine on this type of linen. They are not perfect but I really like them! They give my hallway a completely different feel. The antique ceiling tile imparts an industrial feel. It comes from a church in Minneapolis and dates to the 1920's I am told. Welcome to my new followers. I am happy to have you and in some cases to have found your blogs in return. Have a good week and I'll post about the mercury pendants soon. Your slipcovers came out awesome!! Love anything with grain sacks. Good for you! Oh. WOW you did a fabulous job with those! Your chair covers are wonderful! You have to be on cloud nine with your new pendant lamps! I remember how beautiful they are. Have a great week! They are absolutely gorgeous! I love the grey-blue single stripe one. The antique tile is glorious. Your new blog banner is so pretty too. You're so lucky that you know how to sew like that. Those turned out great! I love them with the little nesting tables in between them. thank you for your kind comments! They make my day! You are so amazingly talented. These look so designer! I'm drooling over them! Thank you for linking this up to "Cowgirl Up!". Michele they are so, so, so amazing!!! Awesome job! You are so lucky you can sew something like this...beautiful! These are so pretty. My mother recovers and reupholsters and she has so many treasures from boring old pieces because of the talent. I envy you the ability. I sew and I quilt but have never mastered slipcovering. Love these - especially the extra touch of monograms on the back side. Just found your blog. It's yummy! The chairs look really nice. Can't believe you did them by hand. The machine and I don't get along. I love hand sewing, once I thread the needle, hah. Oh, they're completely charming and so unique! I can't believe you hand sewed them, that makes them extra special! You are so talented - I love them both. Sewing is not my strength so am very impressed with your talents. They are a beautiful addition to your home. 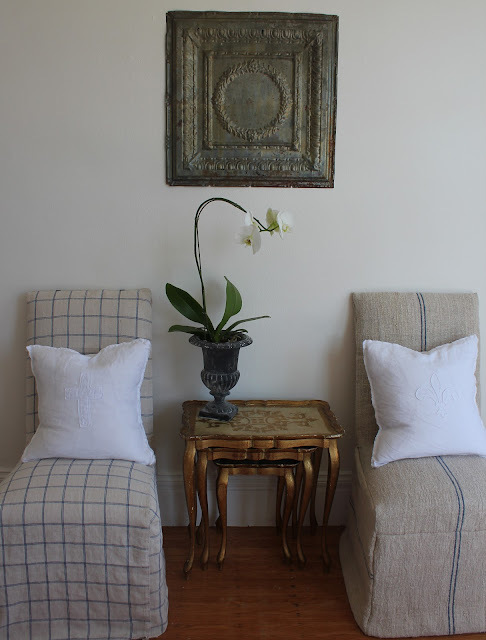 you work MAGIC with those vintage grain sacks...MAGIC! So glad you had a wonderful four days. They are gorgeous. You are so creative! Those are gorgeous. And I absolutely love the tin ceiling tile. Love, love, love your grain sack slipcovers. They look perfect to me. I love that those grain sack slipcovers! 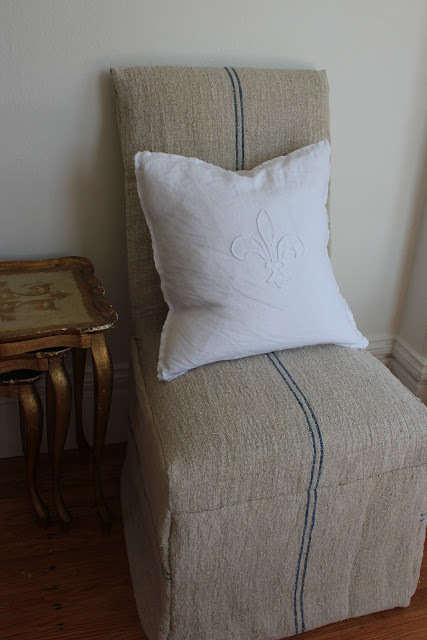 Years ago, I saw a chair makeover with a grain sack like yours with the two stripes in an issue of Cottage Living magazine....I still have that page from the magazine saved because I intend to makeover a chair with a grain sack one day. Where do you find them? You seem to be a very good stitcher! That is a lot to do by hand. 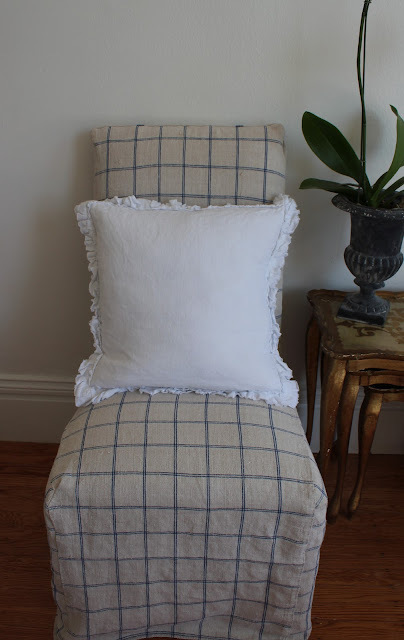 I will be making a mini chair slip today. Yours look great in that vintage fabric. thanks for stopping by my blog! I love yours and am elated to be your newest follower!! Oh, lovely! Thanks so much for linking up to Cowgirl Up! Hope to see you again next week! Wow! They look perfect to me! You did a beautiful job!!!! Just found you and I love your blog. I'm your newest follower. Those chairs are fantastic!! Well done! 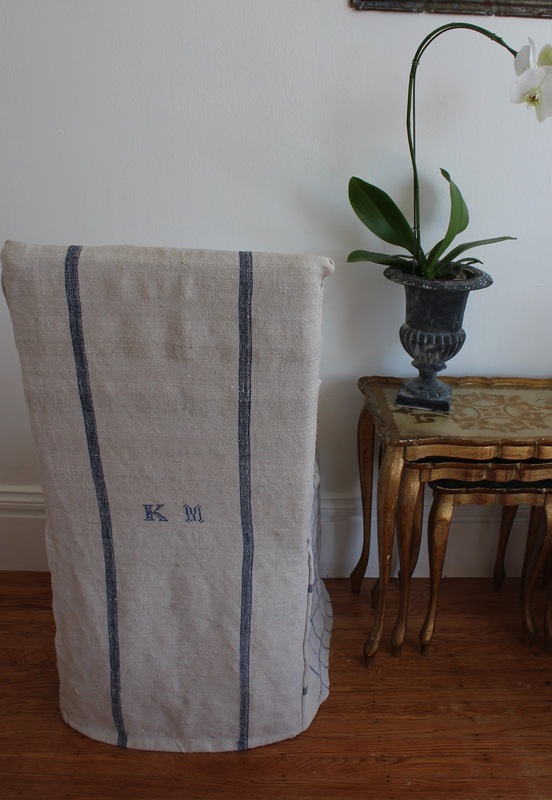 I just love what you have done - the grain sack slip covers are fabulous.